Home / Unlabelled / What has the ECB been Buying? What has the ECB been Buying? The ECB is a month into what it has signaled will be at least an eighteen month asset purchase program. It had begun buying asset-backed securities and covered bonds earlier, but starting last month began buying sovereign and supranational bonds. Even though the public bond purchases were not initiated until the second week of March, the ECB aggressively pursued it objective and settled roughly 60 bln euros of assets last month. This was composed of 5.68 bln euros of supranational bonds and 41.68 bln of government bonds and about 2.6 bln euros covered bonds/ABS. The average maturity of the government bonds the ECB has purchased is about 8.5 years. There is some variance. Lithuania, Latvia, and Slovenia purchased with a weighted average of less than 6.5 years before maturity. The Netherlands average is about 6.75 years. Spain and Portugal are on the other side, with average maturities about 11.6 years and 11.0 years respectively. The sovereign bond purchases are weighted by the capital key, which is their contribution to the ECB and is roughly proportionate with the size of their economy. As of March 31, 11.06 bln of German bunds were purchased. The weighted average maturity is 8.1 years. France is second with 8.75 bln of bonds purchased and an average maturity of 8.22 years. 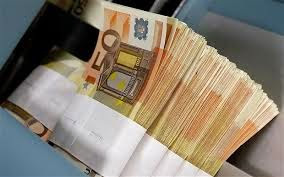 Italy, the third largest, bought 7.6 bln euros of government bonds. The average maturity was a little more than 9 years. Around 5% of the bonds the Eurosystem will buy have been bought. Therefore, one should not draw hard and fast conclusions about the maturity structure. However European central banks are most interested in driving down long-term interest rates. The core countries especially appear to be minimizing the purchases securities bearing negative interest rates. The ECB's rules allow for the purchase of negative yielding bonds but only up to the -20 bp deposit rate. The German curve is negative for seven years, but only up to four years have negative yields near -20 bp. French rates are negative for four years, but no bond is yield is lower than the ECB's deposit rate. The Dutch curve is negative through five years, but only the 2-year note yield is below -20 bp. One cannot draw high conviction conclusions about the pace of purchases. Of the four weeks of data, the first week was not full and the last week was interrupted by the Easter holiday. The middle two complete weeks showed the ECB buying an average of 15 bln euros of bonds a week. One of the big concerns was that the ECB would struggle to find sellers of bonds. The first month showed little strain. European bond yields generally fell over the past month. Ironically, yields fell more Germany and France (10-year yields -23-25 bp) than in Spain, Italy and Portugal (-8, -10, 14 bp respectively). The combination of the deflation, the ECB's negative deposit rate and now sovereign bond purchases is forcing rates negative where one might not expect to see them. Ireland, for example, has negative yields on 1, 3 and 4 year bonds. Spain sold 6-month bills yesterday with a slight negative yield. The three month bill offers a 1 bp guaranteed loss (annualized). When looking at the debt profile of Japan, many economists focus on the net debt rather than the gross. The net debt is the gross debt excluding the debt helped by other government agencies. Central banks are nominally independent but are part of the government. For example, many central banks remit interest payments or profits back to the central government. As central banks buy government bonds, this distinction between gross and net becomes more significant. For example, the gross debt of the US is near 90% of GDP, but the net is closer to 67%. Similarly in the UK, the gross debt is a little above 90% of GDP while the net debt is near 63%. Japan's net debt is near 95% of GDP, but the gross debt is 235%. Some who are opposed to QE in principle are worried not only about the distorting impact central bank activity on markets, but also because of the temptation to treat the debt central bank's balance sheet differently from other debts. From a risk and sustainability point of view, those domestic bonds on the central banks' balance sheets are not the same as private sector investors. There are some who have suggested that central banks can ultimately forgive its sovereign debt. This seems somewhat dubious, and even if legal, could be disruptive. Others have proposed swapping the sovereign debt for perpetual zero coupon paper, which would preserve the fiction.